This page gives an overview of some of the pottery that Bill Crumbleholme is producing, inspired by his researches into ancient pottery. 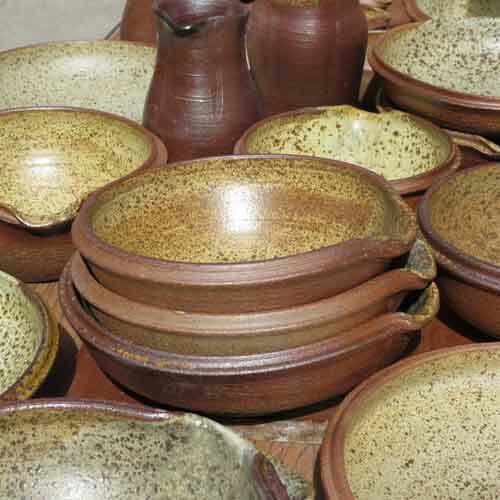 At this link there is a fuller listing of the types of pottery, with details and links to pages about particular styles, complete with downloads. 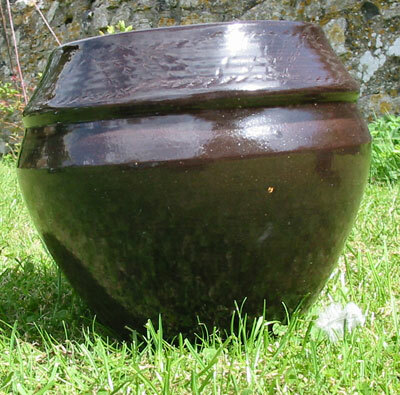 The bronze age beakers and urns are a favourite source, but iron age wares are also copied, in particular the Black Burnished Wares - made by natives of Dorset. In addition to attending one of Bill's own events, many of Bill's pots can be seen and purchased all the year round from the shop at the Dorset County Museum in Dorchester, see this link. Having recently suffered too many breakages in transit, Bill is no longer willing to do "mail order" deliveries of pottery. For larger commissions in the South West of England, he will arrange to produce and deliver vessels himself, or is happy for people to collect them from his studio or from an event during the year. These are wood fired mortaria, one of Bill's best selling lines. There are more images of pots that have been fired in the wood kiln, they can be seen at the webpages devoted to those firings at this link. A recent project used the Upwey Village Nov 5th Bonfire to treat a batch of pots, like the one above, details at this link. A Soda Fired Beaker. This pot is inspired by the drinking vessels of the Bronze Age “Beaker Folk”, made popular by advances in brewing! They are often found in ritual burial deposits, accompanying the dead into the afterlife. There are various types of beaker, this has a belly, waist and flared lip, giving a pleasing shape that is comfortable to hold. 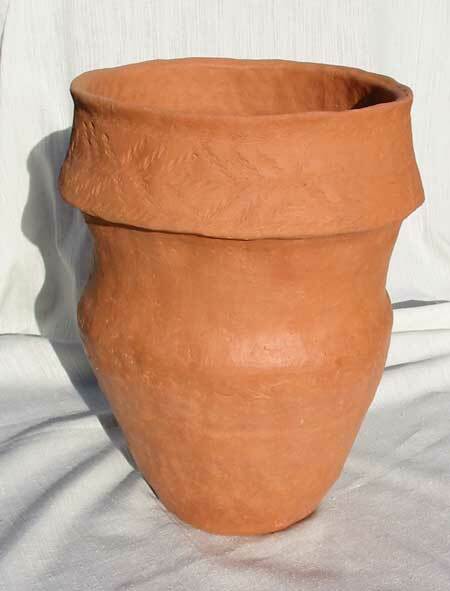 This pot uses a fusion of potting methods of different eras, combining the attractive ancient shape and decoration with more practical modern firing technology. 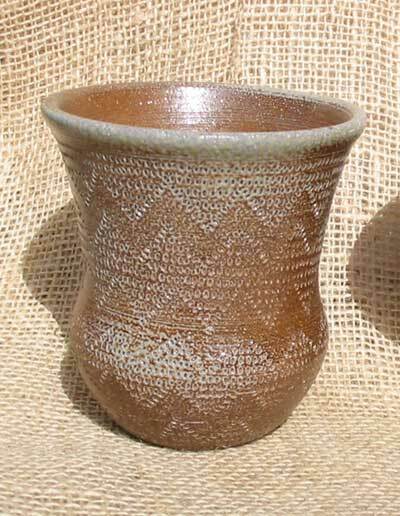 This pot was wheel thrown using coarse stoneware clay, but like the originals, a comb was pressed into the damp clay to decorate it with repetitive patterns of herringbones, zigzags, lozenges & triangles. 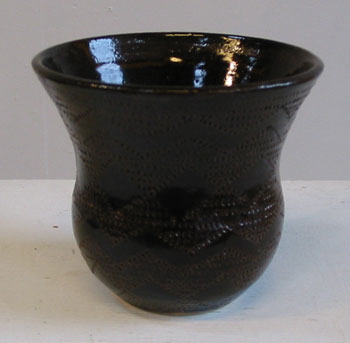 It was fired in a kiln into which sodium bicarbonate solution was sprayed to create the glaze, a technique similar to medieval salt glazing. The pot is suitable for cold or boiling drinks such as ale, mead, cocoa or infusions. It is dishwasher safe. It can also be used for ritual deposits such as pencils! 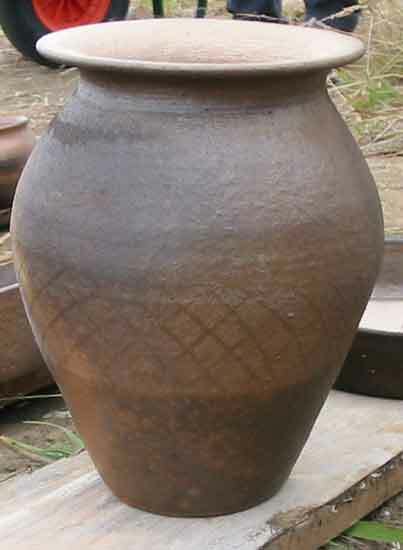 This beaker is similar to the one above, but has been glazed in an electric kiln with a Cornish Stone and Whiting glaze, stained with yellow iron oxide. 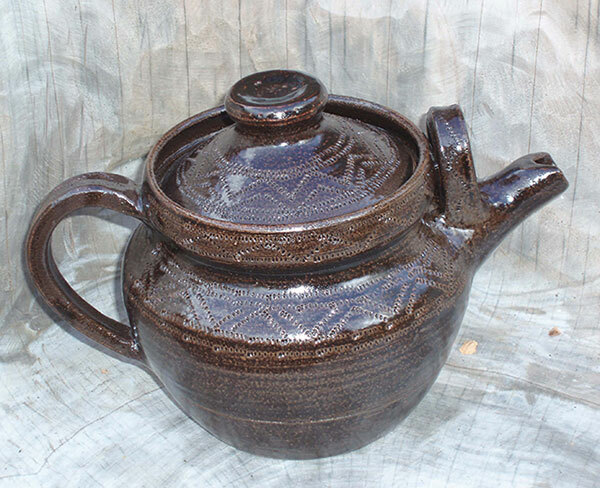 This teapot was commissioned by a friend who wanted it to go with her set of beakers, it features the same comb impressions and brown glaze, which highlights the pattern rather well. A bowl, inspired by the "Celtic" Iron Age shapes of Black Burnished Ware. A feint crossing lattice decoration also harks back to that style. 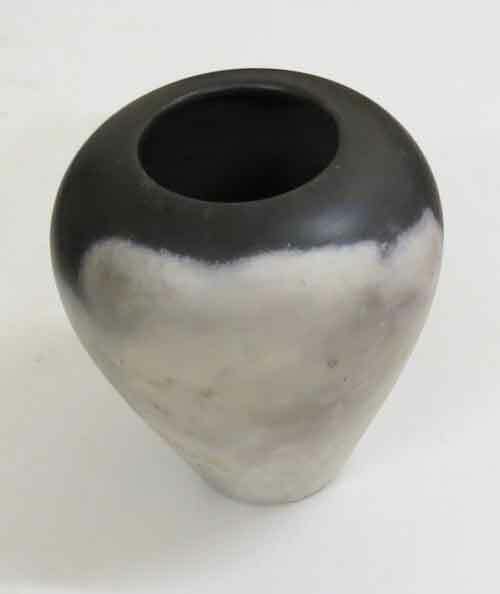 This is thrown and fired in electric kiln with iron rich Cornish Stone glaze. A particularly pleasing shape to handle and cook with. This functional Cooking Pot is inspired by the shape and decoration of Bronze Age pottery. The Collared top is a distinctive and pleasing shape for a versatile cooking pot. The Bronze Age style decoration uses rope impressed into the damp clay. 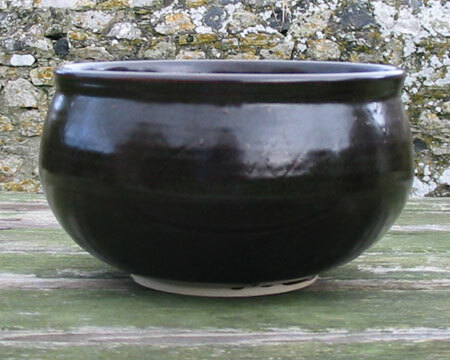 The modern kiln fired glaze is a simple blend of Cornish Stone and Chalk coloured with Iron Oxide. It is an attractive, smooth finish with interesting tonal shades; it is also hygienic and easy to clean. The pot can be used to cook and serve food such as stews or fruit crumbles. It has thick walls which help to retain heat, so the food stays warmer on the table. It is ovenproof and dishwasher safe. For storage, a cloth or animal skin cover can be tied over it – thus keeping the flies and rats off the food. This is an Iron Age bowl, finished by polishing the damp clay and subsequently smoking it in sawdust. 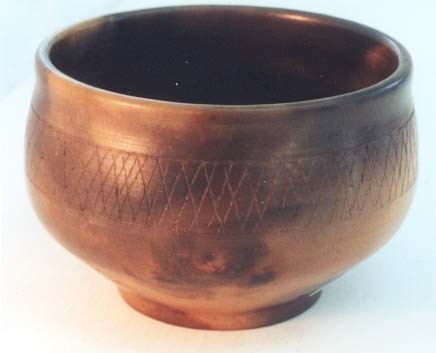 This design classic is known as the Maiden Castle War Cemetery Bowl. They were found with the Warrior burials at that Hillfort, ritually filled with food for the afterlife. 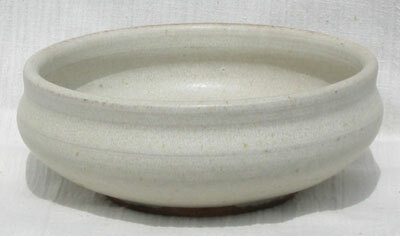 Bowls like these of local origin were prize possessions. The shapes were tried and tested, part of the local heritage, which archaeologists now use to identify cultural remains. The pots were unglazed, with an attractive black burnished finish, usually with a lattice pattern round the outside shoulder. This functional bowl was inspired by that "Celtic" pottery of Dorset. Celtic is an almost meaningless word in this context - something like saying "European". They are a useful size and shape, easy to handle and very versatile, as well as being pleasing on the eye. These modern versions are made for everyday domestic use; they have safe non-toxic glazes and are waterproof, ovenproof, microwave proof, and fully functional. This one has an "oatmeal" glaze, which is an opaque satin finish. They can be used for food preparation, cooking and serving for the living as well as the dead! This jar was inspired by the Black Burnished Ware of Dorset. It was made during a reconstruction project at the Bestwall Quarries archaeological site, near Wareham in Dorset. Two of the Romano British kilns found at the site were rebuilt and fired, before being destroyed by gravel extraction. The site staff made pots under Bill’s guidance and he made a collection of near replicas. Visit this link to see more about the Bestwall project..
Pots like these were made for hundreds of years and were widely exported all over Britain and northern France. 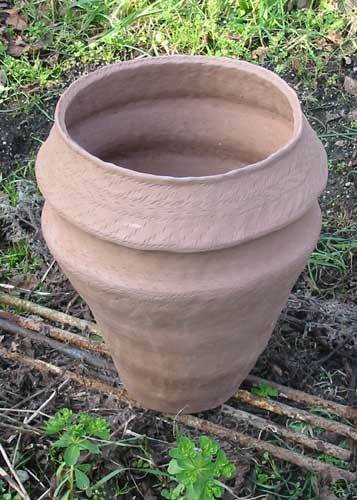 A hand built collared urn, ready for firing (Sadly this one did not survive the bonfire). Bill also makes a range of more modern pottery, slightly less inspired by ancient wares, information about those will be posted here in due course.